Fun packed Festive Foodie Friday is back! Festive Foodie Friday is BACK on Friday 14th December and it’s bigger than EVER!! 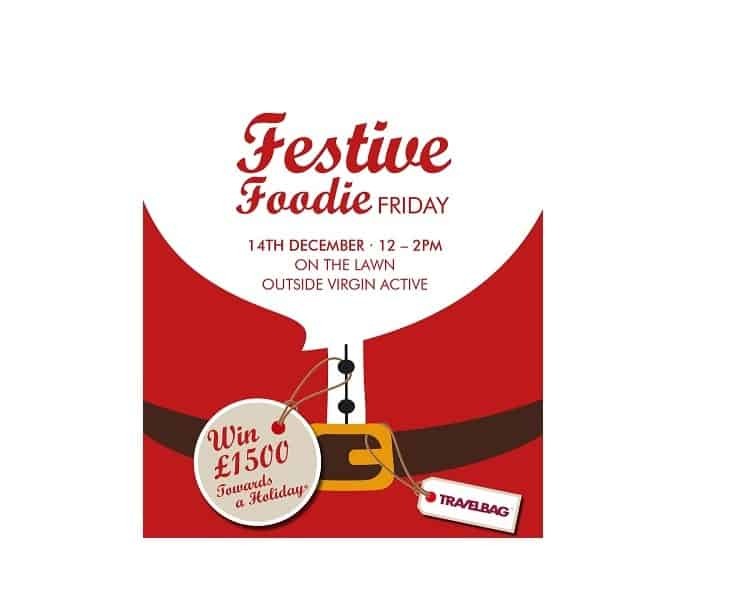 Join us on the lawn outside Virgin Active for a jam packed afternoon of festive cheer, food and fun. There will be prizes to be won, food to be enjoyed and Christmas music to dance to….and all with undercover seating as always! The winner will be picked randomly, this is not affected by the number of times you donate. Your donation must state your full name and a contact email address (you can enter your email address in the ‘leave a message’ box), without both of these supplied you cannot be entered to the competition. The prize for the winner is a voucher for £1500 to be spent with Travelbag Ltd. The voucher must be redeemed either in store at the Travelbag Ltd Solihull Store 26-28 Drury Lane Mell Sq Shopping Centre, Solihull, B91 3BG or over the phone with Maria Cunningham via 020 7001 4067. The voucher cannot be redeemed online or with any other travel bag store. The voucher must be redeemed by the 20th December 2019. The voucher will not be valid after this date. £1000 of the prize will be donated by IM Properties PLC, with the remaining £500 donated by Travelbag Ltd. Entries will only be considered if donations are made from 11am 23rd November 2018 – 4pm Monday 7th January 2019. Any entries made outside of these dates and times will not be considered. The winner will be contacted via the email address provided on Tuesday 8th January 2019 at 9.30am. If the chosen winner does not respond to the email by 2.30pm on the Tuesday 8th January, an alternative winner will be picked and emailed. The named winner must receive the prize. The prize cannot be collected by somebody on their behalf. Only one hat can be redeemed per person.